MYSY Scholarship 2018-2019 NEW RENEWAL APPLICATION RELATED NEWS. MYSY Scholarship 2018-2019: Every Student searching for the chance to get any scholarship to complete his higher study after passing 10th class and 12th class. Here we are giving you some information about MYSY scholarship which can be applied online from the official portal for MYSY Scholarship 2018-2019. 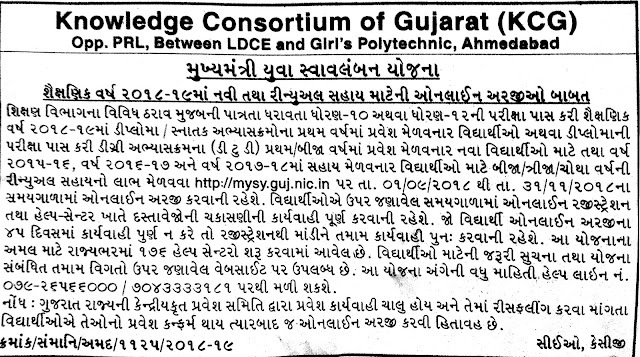 The official site of the authority is mysy.guj.nic.in. Mukhyamantri Yuva Swavalamban Yojana (MYSY) has also known or abbreviated as MYSY. 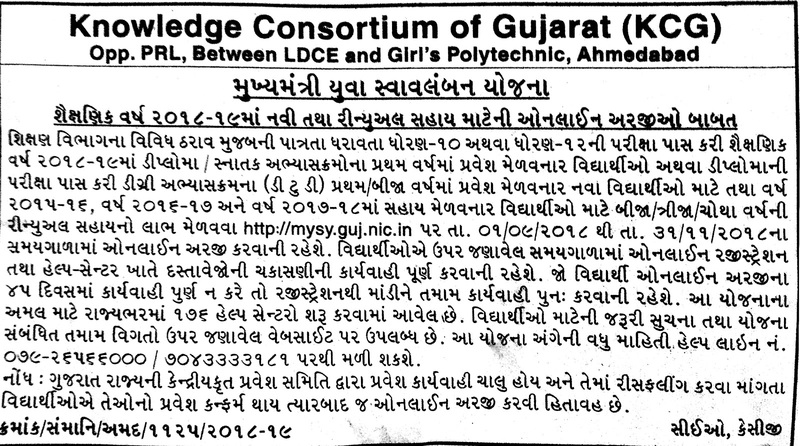 The scholarship program was announced by the Chief Minister (CM) of Gujarat on September 24, 2015. Economic Weaker Section (EWS) students will be offered with a financial help for the higher education. Candidates who are eligible and want to study in higher education (degree or diploma courses) from a certified institute after diploma course. Check SIA Scholarship 2019. The nominated candidate will be helped with a financial assistance of up to 50% of tuition fee or Rs 50,000. From the starting year, a large number of needy students have applied and complete the registration for MYSY Scholarship and tries to get the benefit of this scholarship scheme. This year government will invite the MYSY application form. 0 Response to "MYSY Scholarship 2018-2019 NEW RENEWAL APPLICATION RELATED NEWS. "